Australis has always been owned by the Menendez family of Patagonia. In the late 1800s, the business focused on seal hunting and sheep. Today the company owns and operates one cruise ship (with a second being built) and is run by three brothers who are great-grandsons of the original owner. In 1990, they acquired their first ship -- Terra Australis, once an American vessel named Savannah -- and ran weekly cruises roundtrip from Punta Arenas, Chile. 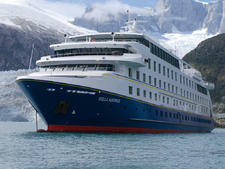 In 2002, the company built the Mare Australis, which it sold to Metropolitan Touring in 2015 and which now operates as Santa Cruz II. About that time (2002), the Murray Channel was opened to commercial traffic, opening the door for cruises to Cape Horn via a more direct route. 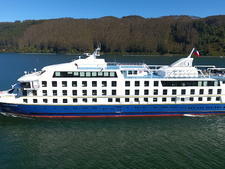 The only cruise that sails regularly to Cape Horn, a World Biosphere Reserve. Special Lectures including Charles Darwin, Cape Horn adventurers, original inhabitants of Patagonia and flora and fauna from the region. The Chilean cruise line specializes exclusively in Tierra del Fuego, an archipelago making up the most remote part of Patagonia. The current fleet of one sailing ship, and one in construction to be navigating early in 2018, travels five routes between Argentina's southernmost city of Ushuaia and Punta Arenas, Chile, including the Strait of Magellan and the Beagle Channel. Itineraries to South America's wilderness regions vary from three to seven nights and take place between September and April. Trips can be one way or roundtrip, either to/from Punta Arenas or to/from Ushuaia. Australis is the only cruise line that offer regular trips with the opportunity to go ashore at Cape Horn, a World Biosphere Reserve that is often referred to as the "end of the earth." Cruising to one of the world's most remote wilderness regions -- South America's Patagonia -- doesn't mean giving up your creature comforts. The all-inclusive line's yacht-like ship Stella Australis has three lounges, comfortably furnished with armchairs and cocktail tables and large windows for taking in the breathtaking scenery. Meals (buffet for breakfast and lunch, table service at dinner) are casual, as is typical of expedition cruises, and they offer menus combining international and local recipes. There is also an open bar where passengers meet and mingle over a few drinks and swap tales of the day's shore excursions. Cabins, for an expedition ship, are spacious, measuring 161 to 220 square feet. Each is handsomely decorated in nautical colors and has a picture window and a private bathroom with a shower. Daily Zodiac rides (included) are offered to take everyone ashore for such excursions as seeing a colony of Magellan penguins, visiting Cape Horn National Park or hiking near a glacier or into a rugged rain forest. During Zodiac trips through the fjords, there's a chance of spotting southern elephant seals sometimes or dolphins at other times. A multilingual expedition team leads the tours when they're not giving educational talks back onboard. English and Spanish are the official cruise languages. Tours in French, German, Portuguese or Italian, are offered when there's a group of at least 15. Passengers are typically well-traveled and curious about wildlife and geology. Women and men choose Australis in equal numbers, and they tend to be North and South Americans of Boomer age. More importantly, they have the desire, time and money to fly to the southern tip of South America for this unique cruise. Stella Australis is a 4,500-ton, 292-foot mega-yacht-style ship, built in Chile in 2010. It carries 210 passengers in 100 cabins, each with a picture window. Cabins measure 177 square feet, except for a group of four that comes in at 220 square feet. Ventus Australis is a twin to Stella Australis, currently being built in a Chilean shipyard. It will also carry 210 passengers in 100 cabins, and will start sailing in January 2018.